Indian analysts are in two minds whether the tensions were precipitated at a local level on the Chinese side or were part of a deliberate move calibrated from Beijing with a political or diplomatic objective. The tension in the Ladakh sector of India’s disputed border with China subsided after some four weeks of suspense and high drama as unobtrusively as it first appeared in mid-April. The only difference between the beginning and the end is that while the Indians were taken by surprise by the Chinese troop “intrusion,” the withdrawal has been a negotiated affair. This difference underscores three things. One, China’s intention was not belligerent. Two, the negotiations for the easing of the tension took place through the existing mechanism for the resolution of such precipitate situations. Three, negotiations would have resulted in some sort of understanding, which in turn helped defuse the situation. The Indian analysts are in two minds whether the tensions were precipitated at a local level on the Chinese side or were part of a deliberate move calibrated from Beijing with a political or diplomatic objective. When it comes to the “inscrutable” Chinese, there is scope for seamless speculations. It stands to reason that given the high sensitivity of the border dispute with India and the volatility of the situation in Tibet and their centrality for the Chinese foreign policy as a whole, the local units of the People’s Liberation Army deployed to Tibet and the China-India border region could not have acted thoughtlessly. Besides, taking into account the way the Chinese political system works, a new leadership in Beijing was just about setting out on a ten-year long journey and a misstep by the caravan was highly improbable. What might have been the Chinese objective? The Chinese have said very, very little – nothing, in fact, in comparison with the high-decibel rhetoric on the Philippines, Vietnam or Japan. Evidently, they were chary of inflaming passions. The Indian establishment too – that is, the political and foreign policy establishment – also kept a “blackout” on the negotiations leading to the easing of the tension. What really caused the tension? Was the tension eased as a result of an understanding reached? If so, what was the deal? But matters have been left to conjecture. Putting together the bits and pieces of whatever percolated through the secrecy veil, this was indeed a “localized affair,” as Prime Minister Manmohan Singh put it. Delhi cauterized the wound and went about with the business of life – an Indian military delegation visited Beijing as originally scheduled; External Affairs Minister Salman Khurshid paid an official visit to China; and, a cordial and ceremonial welcome was given to the visiting Chinese Premier Li Keqiang. In a nutshell, it would appear that the Chinese side compelled Delhi to intervene at the highest level to remove certain Indian deployments to the hotly contested eastern Ladakh sector of the border through the recent period, which they found objectionable and threatening their sensitive communication links in the region, after having failed to resolve the issue at the local level. And in the bargain, the border dispute itself has come to the front burner, something which the Chinese side had been wanting and the Indians were reluctant about. The Special Representatives of the two countries who are entrusted with the responsibility to negotiate a settlement of the border dispute are to meet in Beijing next month. However, if it seems a happy denouement, nothing could be further from the truth. The question that begs an answer is why the Chinese resorted to pressure tactic at a time when the ties with India seemed on an upward curve as signified by the extraordinary gesture by Li to make India his first visit abroad after assuming office. Curiously, these are times when Beijing has its plate full already with acrimonies, friction and tensions with a number of its neighbours and it didn’t look good to pick up yet another row with yet another neighbour. All in all, the Chinese may have made a point to the Indian leadership that war is far too serious a matter to be left to soldiers. Put differently, they may have drawn attention to the danger that any “forward policy” with a view to secure unilateral advantages on the ground along the disputed Line of Actual Control [LoAC] that separates the two countries’ armed forces could lead to ugly situations, fraught with high risk of confrontation. The heart of the matter is that there is an eerie similarity between what happened last month and the action-reaction syndrome ensuing from India’s “forward policy” in the run-up to the 1962 conflict. 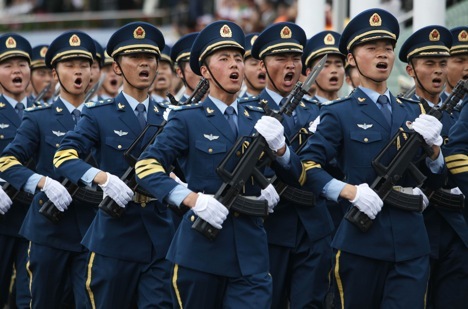 From the Chinese perspective, it is advantageous to “freeze” the situation as of now since they already enjoy many tactical advantages on the ground in terms of the geography and logistics and communication links. The Indians, on the other hand, are acutely conscious of their disadvantages and would like to do something about it on a priority basis to bring about some parity. Clearly, there is plenty of scope for flashpoints arising in the future too unless there is a conscious political attempt on both sides to ensure that peace and tranquility prevails on the LoAC. The 1962 conflict with China still rankles in the Indian consciousness and the security analysts acknowledge the existence of a “revenge” mentality. Of course, that is plainly jingoistic and cannot be injected into the policymaking processes in Delhi. Neither the present climate in world politics and the co-relation of forces internationally nor the dismal state of India’s political economy allows Delhi the latitude to contemplate settling scores with China through coercive methods. But what is most certainly going to happen is that the Indian policymakers will hunker down. To be sure, they have gone through Li’s visit with impeccable dignity and composure. They didn’t mind that after all that happened so very recently the Chinese dignitary reached out to the Indian public opinion showering petals of goodwill all around. They even talked trade issues with Li. But deep down there is a profound sense of disquiet. The impression is sinking in that there has been a breach of trust on the part of the Chinese. The detractors of the government’s policy of constructive engagement of China smell blood. The Chinese incursion is being projected into the public discourse as yet another manifestation of Beijing’s malfeasance toward India. How this plays out on the geopolitical plane will bear watch. India will at all times want to retain its strategic autonomy, but, equally, a credible enough case can be made out that given the uncertainties in the ties with China, India needs to be part of an alliance system involving other like-minded countries that are wary of Chinese intentions. The current visit of Manmohan Singh to Japan assumes added significance from this perspective. The Indian defence minister A.K. Antony is also due to visit Australia. The US-India Strategic Dialogue is scheduled to take place in Delhi in June, which also involves secretary of state John Kerry’s first official visit to India and his talks with the Indian leadership at the highest level will dwell upon the US’ rebalancing strategy in Asia. The “pro-US” lobby in the Indian media and think tanks has resuscitated the thesis (which didn’t find acceptance so far at the policy level) that India should tap into the US’ rebalancing strategy and build up its strategic capabilities. Indeed, the tensions with China become a powerful argument for India to develop close military ties with the US, Japan and Australia. Having said that, there are overlapping templates in the geopolitics of Asia-Pacific, which complicate India’s policy options – for instance, Obama administration’s determined push to make China’s new leadership a “stakeholder” in the international system as evident in the initiative to hold the forthcoming summit with President Xi Jinping in California on June 7-8; Asian countries’ reticence to be part of any containment strategy toward China; the steady deepening and growing interplay between the ASEAN economies and China’s growth strategy. Even with Japan, the caveat must be added that Manmohan Singh is visiting Shinzo Abe’s Japan. Again, the US’ capacity to commit to a long-term “pivot to Asia” is itself in doubt, given the imponderables in the recovery of its economy and the decline in its global influence. Paradoxically, Beijing has weakened those very power centres in Delhi, which were working to usher in a brave new world of India-China partnership against some very heavy odds, whereby the two countries would work together on their convergences and shared interests even as they work on the border problem.